Add all the ingredients to a mini chopper and chop until creamy. Set aside. Place the butternut squash on a baking tray, rub with the olive oil and sprinkle with salt and pepper. Place in oven and bake for 45 to 60 minutes, until tender inside and caramelized on the outside. In a large bowl, add the salad ingredients and mix gently to combine. Gently stir in the roasted squash. Using medium heat, place the pitas in a frying pan and toast until crispy on both sides. Remove and roughly chop. 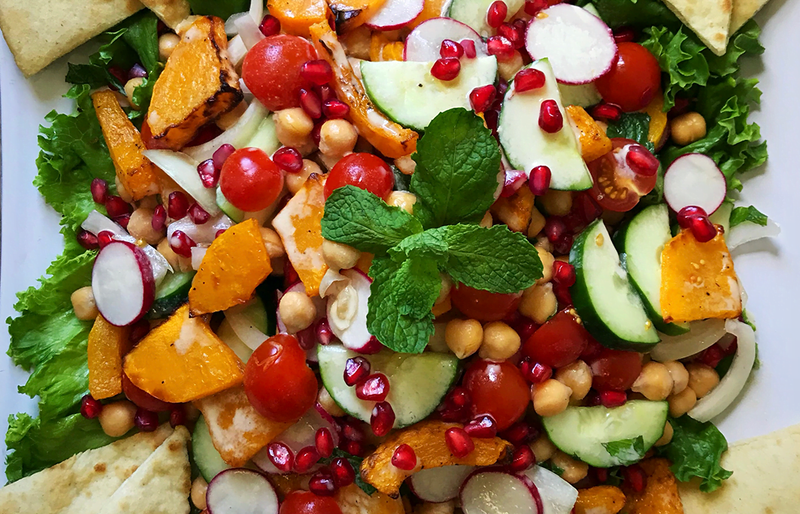 Top the salad with toasted pitas and generous amounts of tahini dressing.